It was just like the pictures! This bracelet is a wrap around bracelet, and I'd suggest getting the biggest size as it runs small. I ordered an XL I believe, and it fits me perfectly, so hopefully it's big enough for my husband (as a gift) it does stretch though, and you could choose to only wrap it twice rather than 3 times. Great product looks good on me. Beaded bracelets can feature both stone and wooden beads. They provide a unique way to wear a little color on your arm and fit practically any wrist. All our bracelets are in stock. Feel free to scroll all the way down for some great information about bracelets and finding your size. On this page, you'll find all our pearl bracelets. The vast majority are made with wooden beads or natural stones and feature solid elastic bands to hold the beads together. However, we do offer a few bracelets that are fitted onto strings, such as cotton or nylon, so they can be adjusted in length. 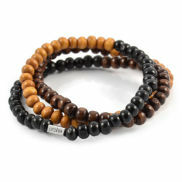 Bracelets with wooden beads are generally available with either 6mm (0.24") or 8mm (0.31") pearls in black, brown or cream colors. Wooden beads are the most popular. There are two ways to color wooden beads. One way is to paint them, which gives them a very glossy surface. The other way is to roll them around in a large drum. This gives them a more natural appearance, with a matte finish showing off the details of the wood grain. We carry a selection of both kinds of wooden beads. These bracelets are held together by cord, usually braided. Originally made famous by the American Shamballa, today knotted bracelets are found in many places and designed for both men and women. 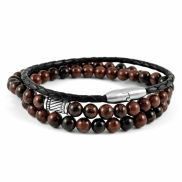 All stone bracelets from Trendhim are made with real natural stones. Because every natural stone is unique, no two bracelets are exactly alike. Stones used for male bracelets are typically not as expensive as ones used in female bracelets. 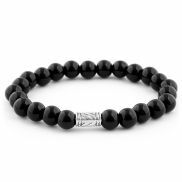 Stone bracelets for men are mostly made with mineral stones, although there are exceptions. We offer pearl bracelets with inexpensive stones as well as high-value stones. The rubber band for a bead bracelet with stones should be made from silicone rubber for maximum life. Stones have a tendency to chew through ordinary rubber bands, tearing the through the band. That's why all Trendhim's stone bracelets are mounted on silicon rubber. All bracelets on elastic bands from Trendhim are one-size fits all, which means that they'll fit just about any wrist. Most have a circumference of 8.25 inches. Our beaded bracelets are best suited for people with wrists of about 6.3" to 8.5". You can measure your wrist as shown in the image above.